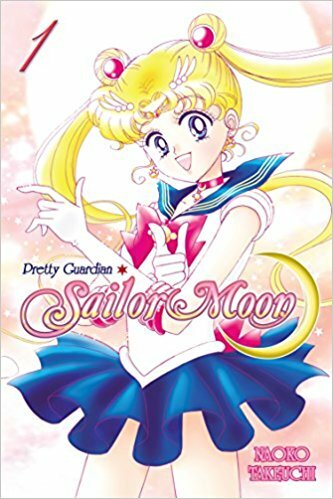 I'm not sure how I've made it this far without ever having seen Sailor Moon anime or having read any Sailor Moon manga, but she's certainly popular enough of a character that it was high time I remedied that. I suppose in the end I can understand why she's enjoyed such a following though I'm likely not the demographic Naoko Takeuchi was aiming for. Sailor Moon and her gang have well-defined personalities and she doesn't hide stereotypical feminine attributes while making the girls appear heroic. I wasn't, however, wild about the cliched plot (the villain tries to find crystals that will enable her to take over the world) and even less impressed with the art. The majority of panels seemed to be characters with next to no setting but with really busy and distracting patterns that had no apparent connection to the characters or plot. I loved Sailor Moon when I was younger. I used to watch it all the time. I even had Sailor Moon merchandise. I guess I grew out of it, but every time I see Sailor Moon now, I wonder what I'd think of the series as an adult. I've also thought about reading some of the Manga, but I don't need more books.